Elegant, well-made stands that are both full of intelligent features and strong enough to withstand years of use. Super sturdy in use. Quality build. Simple design. Those looking for fancy features should keep looking. Crush Drums and Percussion has a strong affinity with the US military and has named both its hardware ranges after American tanks. While its flagship M1 series is currently restricted to bass drum pedals and a hi-hat stand, the M4 series on review is more comprehensive. The five-piece hardware pack contains two boom arm cymbal stands, a snare stand, hi-hat stand and single bass drum pedal. Crush describes these US-designed, Taiwanese-built M4 stands and pedals as medium weight; in reality they are sturdy enough to cope with all but the most brutal of players. "Judging by the weight of the hardware case it is clear that this is a set of heavy duty stands"
The stands sit on double-braced tripods and the legs splay generously, guaranteeing stability. Hefty 1.1" diameter tubing is used on the bottom section of each stand and two- part memory locks are found at each subsequent junction. Both of the cymbal stands have three sections of tubing and disappearing booms; Crush doesn't manufacture an equivalent straight cymbal stand but a top section with boom for clamping onto rack systems is available. The pedal section of the hi-hat stand can be swivelled within the tripod legs to accommodate a double pedal and the spring tension is easily adjustable via a large knurled knob. 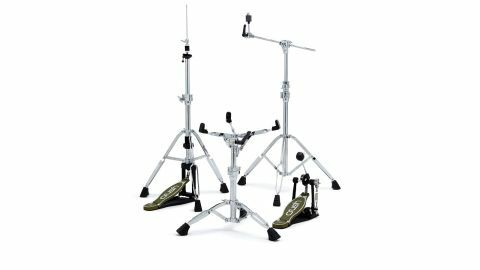 The bass drum pedal shares the black coated footplate with the hi-hat stands and also features a double chain, adjustable stroke and two-sided beater. Judging by the weight of the hardware case it is clear that this is a set of heavy duty stands. Once planted, the cymbal stands feel as though they have taken root in the stage - nothing we do persuades them to budge. With the three sections extended and the boom left vertical the stands are tall enough to reach the ceiling. Precise adjustment of the angle of the cymbal is possible thanks to the toothless tilter (tightened by the equally user-friendly large ABS handle). The snare stand is similarly solid, cradling the snare gently while remaining impervious to stage creep. Both the hi-hat stand and bass drum pedal function smoothly and can be quickly adjusted to preferred feel. Any absent bells and whistles - such as interchangeable cams or beater weights - are compensated for by good design fundamentals and quality build.